This style has been copied by numerous manufacturers throughout the world. Diamonds surrounding a main stone can be seen in necklaces and other jewelry from more than two hundred years ago. At that time, rose-cut and Old Mine-cut diamonds were used, and jewelry simply was not about to bring out the kind of beautiful brilliance seen in the ring on the next page. The main sapphire in this ring exhibits a well-balanced mosaic pattern, and it is an extremely beautiful and defect-free gem that shows lively tones of blue. Van Cleef & Arpels calls this style “Gazelle,” as the main stone and the diamonds that surround it evoke the image of an adorable gazelle’s eye. No doubt many will recognize this gazelle style as one that is often copied by various manufacturers around the world. Most copies are made as inexpensively as possible, appearing similar to this ring but marketed at a fraction of the cost. Looking at the real thing, one notices that the similarity of such copies is only on the surface. Genuine jewelry is made carefully, one piece at a time, after deep consideration of how to bring out the beauty of the gemstones and make a piece that is comfortable to wear. The other jewelers introduced in this book do not use this style. Their pride in their work would not allow them to make a look-alike piece, for doing so would cause them to lose their own identity. A characteristic of the gazelle style is that it is made with main stones of different size and beauty. After gathering the appropriate number of round diamonds of just the right size, the size of the shank and how to best use the gemstone are carefully considered for each individual ring. The style of the shank has undergone changes over time. 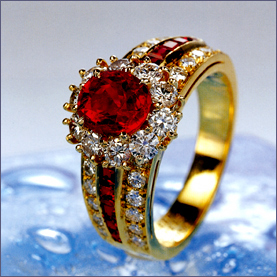 The ring shown below with a row of ruby baguettes is a classic style that has been made for several decades. The shank on the sapphire ring is a relatively new model, but those with even more modern styles are now being produced. This is a wonderful ring that can be chosen for the quality of the main stone, the balance of the shank, and its compatibility with other jewelry.